Words With Friends Cheat is the Number One Words With Friends dedicated unofficial fan community on the net. 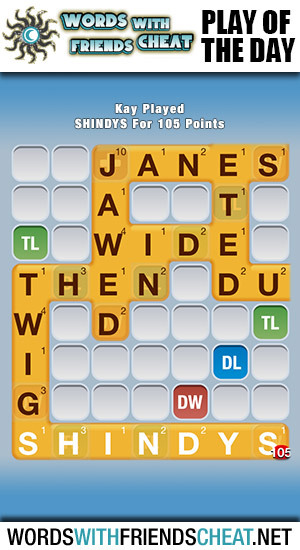 Today’s Words With Friends – Play Of The Day is SHINDYS (105pts) and was submitted by Words With Friends Cheat user Kay. Using an “S” to connect to twig, Kay placed SHINDYS over two triple letters and a triple word, also unleashing the seven letter bonus. We now offer cheat support for the brand new Words With Friends spin-off game, Hanging With Friends. This game is a combination of Words With Friends and Hangman. You guess the a word that your opponent builds and then you build a word for your opponent to try and guess. Use the Hanging With Friends Builder to build words and the Hanging With Friends Solver to help solve on your turn. WordsWithFriendsCheat.net is a cheat site for the games Words With Friends, Scrabble, Wordfeud, Wordwise, Wordsmith and Lexulous. Use the Words With Friends Dictionary page to search to see if a word can be played. Use the Words With Friends Word Builder to enter your rack letters and find all the words that can be made from them. WordsWithFriendsCheat.net Word Builder results are displayed in a table with sortable columns by Name, Word Length, Word Score and Definition. This site is not endorsed by or affiliated with Zynga Inc., Scrabble, Hasbro or Mattel. Trademarks are the property of their respective owners. Game content and materials Copyright Zynga Inc. All rights reserved.